Stephanie Johanson wants to change the way people think about science fiction. "They immediately think that it's a teenager thing to get into," said Johanson, a resident of Saanich. "If you're still a science fiction fan when you're older, then there's something wrong with you." But she thinks those attitudes come from not understanding how broad a classification science fiction encompasses. "There's mystery, romance, even westerns and everything else all thrown into it," Johanson said. Johanson and her husband Karl love the sci-fi genre so much, and want others to love it too, that they've launched a new Victoria-based science fiction magazine called Neo-opsis. They publish the magazine out of their home. The name is made up of two Greek root words: "neo" meaning new and "opsis" meaning view or opinion. The first issue, which was published this fall, features writers from as far from Victoria as England and Nova Scotia. Some of the writers featured in the premiere issue of what they hope will be a quarterly publication, already make a living as writers, though not necessarily as science fiction writers. The couple, who for now are primarily selling the magazine ($6.95) through their Web site (www.neo-opsis.ca), have received submissions from writers in Victoria as well. Besides stories, Neo-opsis also includes sci-fi related artwork, book and movie reviews, listings of upcoming events related to science fiction and opinion pieces. 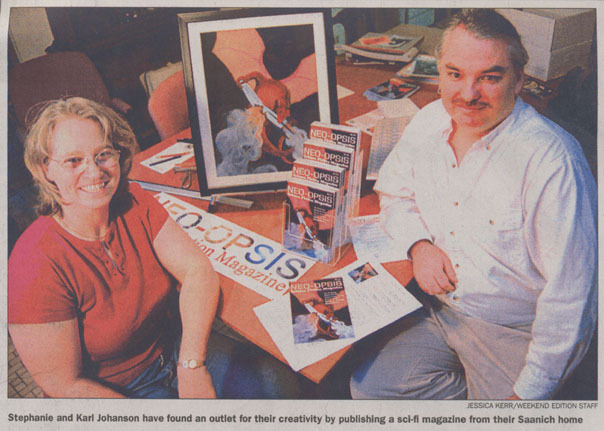 The couple started the new science fiction magazine after they stopped working for a local computer game studio, which produced educational games. They realized after that gig ended that they wanted to find another outlet for their creativity to flourish. "When the studio closed, we realized we were kind of hooked on the idea of doing really creative work and hopefully inspirational and educational work as well," Karl explained. He said he's attracted to science fiction not only because there are many unusual ideas brought forward within the genre, but those ideas also have far-reaching implications. Take an interesting new invention, for example. "What effect is that going to have on society and on other inventions?" Karl asked. "I think science fiction is very good at accounting for the possibilities." Science fiction is "not like a prediction of the future but it considers the implications of complex ideas", he said. Stephanie said what attracts her to science fiction is that it requires using imagination. "It's the fascination of something that might happen or the fascination with something that is so far-fetched that you can't believe that it would ever happen," she said. "It just gets your creative juices going and I've always been interested in the art end of it." Stephanie enjoys the crossing over of fantasy into science fiction as well, so she incorporates creatures such as dragons into her art. She functions as the assistant editor and art director for the magazine. Karl is the editor. Both look after the administrative aspect of the business. In addition to challenging readers with new ways of looking at the world, the Johansons also want to encourage more people to read. Both of them disliked reading when they were kids, until they discovered science fiction. "Sometimes it just takes one thing to get you started on reading everything," Karl said. "We're hoping we can inspire some people to pick this (magazine) up and go, 'Hey, reading is fun. Thinking about ideas is fun.'" All content of this site including graphics, text and programming are the property of Victoria News, a Black Community Newspaper Group company. Use of any portion of this site is permitted in any medium only with the express written permission of Black Community Newspaper Group.